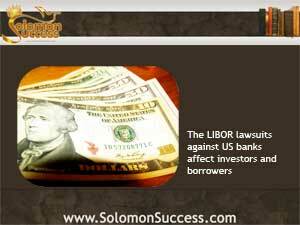 Solomon Success > Blog > What Does LIBOR Mean for Investors? Welcome! If this is your first time visiting Jason Hartman's website, please read this page to learn more about what we do here. You may also be interested in receiving updates from our blog via RSS or via email if you prefer. If you have any questions about Christian investing feel free to contact us anytime! Thanks! What Does LIBOR Mean for Investors? King Solomon’s antipathy toward evil and unjust men is clear throughout his Proverbs. And equally clear is his command to seek out wise counsel, be open to learning, and deal prudently with others. The LIBOR lawsuits involving major US banks echo the monarch’s concerns: are the banks evil and unjust entities? Solomon advises everyone to acquire wisdom whenever possible, since wisdom is the foundation of prudent choices. And in today’s world of finance, it’s important to know how the little- known LIBOR rate has an impact on borrowers an US investors large and small. LIBOR stands for the London Interbank Offered Rate – the average interest rate that is estimated by major London banks if they were borrowing money from other banks. Now, it’s the primary standard for establishing interest rates for short term loans worldwide and is used by credit card companies, mortgage lenders and investors to set rates. The LIBOR depends on estimates provided by leading banking institutions around the world, and there’s where the potential for fraud enters the picture. The 16 US banks implicated in the LIBOR cases were accused of manipulating their estimates for their own profit and image in the financial world since 2008. Under some circumstances that might have some positive outcomes – reporting estimates lower than actual rates might end up benefiting some borrowers, for example. But by 2012 British banking giant Barclay’s had been fined for manipulating LIBIR rates, and the US Department of Justice had launched a criminal investigation into allegations of LIBOR fraud by US banks. Those lenders were already enmeshed in settlements ad litigation stemming from practices related to the housing collapse of 2008 and the subsequent scandals involving fraudulent management of foreclosures and mortgagee lending. The accusations of LIBOR fraud followed on the heels of charges that the banks had fraudulently processed foreclosures and misled borrowers about interest rates and loan products. But In a number of the LIBOR cases, prosecution depended on demonstrating that the defendants had violated antitrust laws designed to protect competition. The banks in the LIBOR cases, opined the US Disrict Court, were not attempting to inflict harm by impeding competition. Rather, they were only misrepresenting data, and reporting that data constituted a cooperative, rather than competitive move. And although some LIBOR-related cases are still alive, the court’s ruling in favor of the banks represents one more successful attempt by the nation’s large lenders to play the heavyweight, pushing back against attempts to police the industry while refusing to police themselves. Banks and LIBOR: Sidestepping Justice?